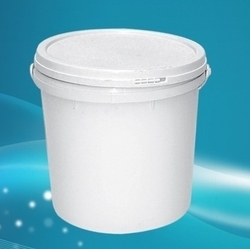 Make sure to close the lid tightly every time you add waste into the bucket. Not doing so could result in rotting rather than fermenting of the food waste! 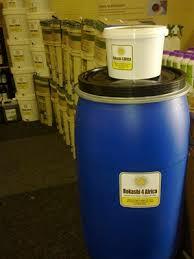 Add a generous coat of Bokashi inoculants to the final layer of food waste and seal the lid tightly. Remember, the microbes need an air-tight environment to do their job!!!! To feed garden or house plants. 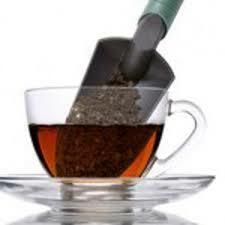 Use 2 teaspoons to 1 litre of water and apply directly to the soil. For trees and shrubs, use 4 teaspoons to 1 litre of water. As a foliar spray use 1 teaspoon to 1 litre of water. Pour the concentrated liquid directly into your drains, toilets or septic system to prevent odours. Please note this liquid is not equivalent to and should not be used in place of the original EM concentrate. 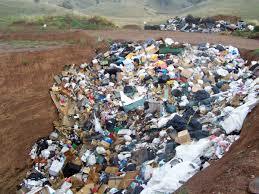 The Garbage Juice cannot be stored and must be used within 24 hours after drainage or it could spoil. In Gardens: As the fermented food waste is initially acidic take care not to burn roots of herbaceous plants (herbs, flowers and veggies). 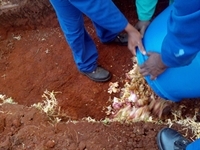 To prevent this the food waste can first be composted (by using the simple method below) in a hole/trench in the ground for 1 – 2 weeks and then used on delicate herbs, flowers and veggies. Alternatively you can just bury it (usually a spades depth) around the base of trees and shrubs or add it to your compost heap. In the compost heap: Add to the bottom or middle of the compost heap. 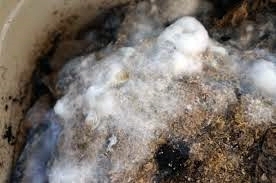 Process works better if you mix the food waste with some of the composting material before introducing it to the heap. Adding some of the Bokashi inoculant to this mix will further assist the compositing process and the quality of your compost. Do not use anti-bacterial soap as this can kill of the beneficial microbes, making it harder for the fermenting process to start in the bucket.